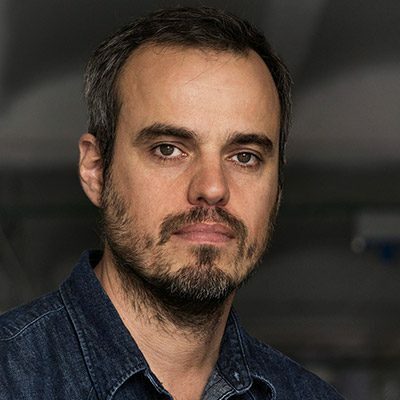 In 1999 he obtains the Industrial Design Degree from the University of Buenos Aires. From then onwards his career has been focused on digital design. He started a career as a web designer to then become the director of creative projects for Coca-Cola, Ford and Nestlé, among others, constantly experimenting with new ways to interact and explore the new experiences that technologies allow. In 2002 he studied the Animation Master of the Pompeu Fabra University, where he did his first short film “Posibilidades de la Abstracción”, selected and awarded in the main animation festivals in the world. From then on he has worked in all sorts of projects: feature films and animation series, videogames, TV ads, and more, for clients such as TV3, TVE, La Sexta, Discovery Channel, Disney Channel, Danone, MWC, Coca-Cola, Cartoon Network, TNT, Directv, Disney and many more. As a teacher, he has been a professor for four years in the University of Buenos Aires, he has been in charge of the animation master in the 9Zeros School, he has collaborated with Dirk van de Vondel in the Author Animation subject of Escola Massana and has also been in charge of the UI/UX Design subject in the EU Business School. He currently teaches Computer Animation in ESDi.